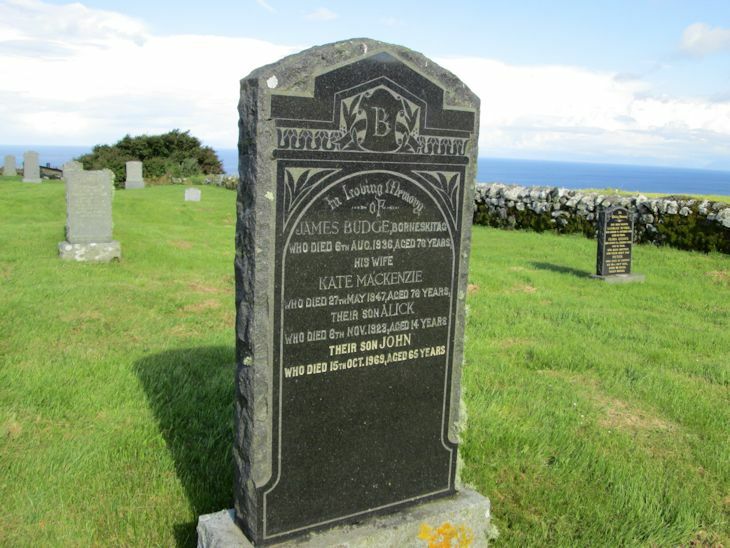 Skye Gravestones | James & Kate (Mackenzie) Budge, Alick & John. James & Kate (Mackenzie) Budge, Alick & John. In loving memory/of/JAMES BUDGE, Borneskitag/who died 6th Aug. 1936, aged 76 years/his wife/KATE MACKENZIE/who died 27th May 1947, aged 76 years/their son ALICK/who died 6th Nov. 1923 aged 14 years/their son JOHN/who died 15th Oct. 1969, aged 65 years. Picture Added on 18 July 2014.